Under the direction of Scott Youngs and Sue Westendorf., All Saints Episcopal church has one of the finest community choirs around. 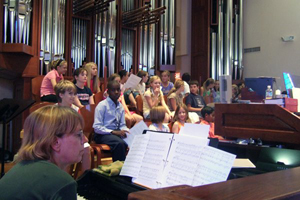 In their own words “An integral part of the worship at All Saints', the music department strives to educate and train people to make music of the highest caliber as part of their offering and ministry.” You only need to listen once to understand how true that statement is. Thanks to an introduction years ago by Mrs. Shannon Forseth, Dan Malone and Mouse Recording have had the privilege of capturing the wonderful sounds of the All Saints Choirs for their various CD projects.